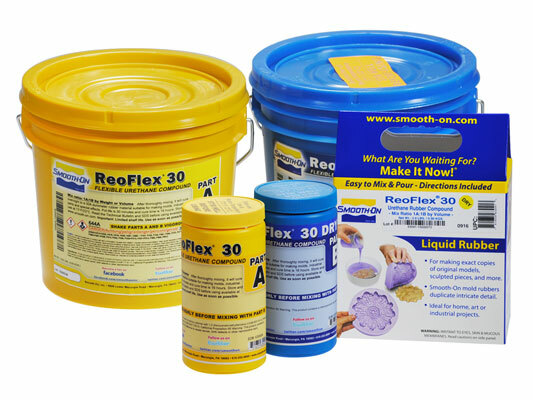 ReoFlex™ 30 Product Information | Smooth-On, Inc. Specific Volume 27.5 cu. in./lb. Shrinkage <.001 in. / in. ReoFlex™ urethane rubbers offer superior physical and performance properties for production casting of wax, plasters, and resins. ReoFlex™ urethanes are available in 20A, 30A, 40A, 50A and 60A Shore hardnesses and feature convenient one-to-one by volume mix ratios. Vacuum degassing is not necessary and ReoFlex™ rubbers cure with negligible shrinkage to a durable rubber that will last in production. ReoFlex™ “Wet” rubbers will shrink somewhat over time vs. “Dry” formulations. 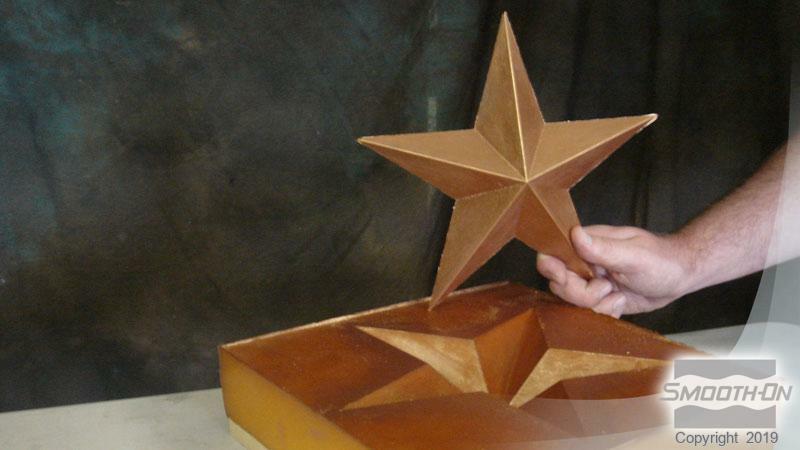 ReoFlex™ mold rubbers are used for a variety of applications including making molds to reproduce sculpture and architectural elements, as well as for making special effects, toys and prototypes. Vibrant colors can be achieved by adding So-Strong™ Color Tints, available from Smooth-On. Casting Concrete? 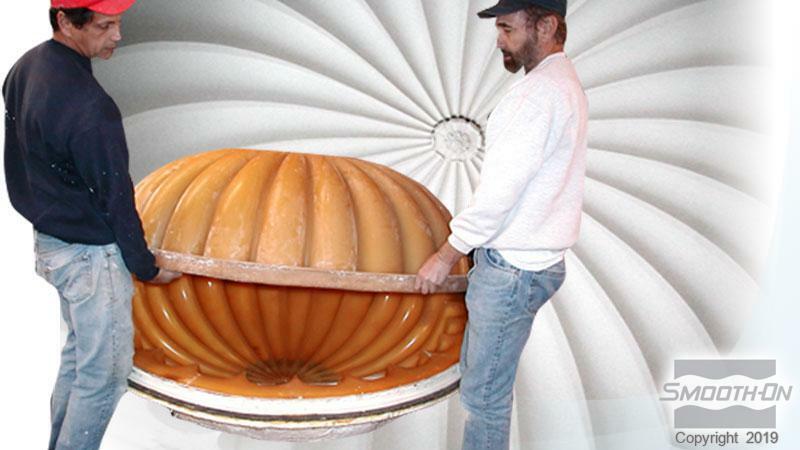 Look into the VytaFlex™ series of urethane mold rubbers. VytaFlex™ urethanes were formulated specifically for casting concrete / pigmented concrete and feature Smooth-On’s exclusive ‘V-Polymer™’ technology. Preparation - Store and use at room temperature (73°F/23°C). Environmental humidity should be as low as possible. Good ventilation (room size) is necessary. This product has a limited shelf life and should be used as soon as possible. Wear safety glasses, long sleeves and rubber gloves to minimize contamination risk. Some Materials Must Be Sealed - To prevent adhesion between the rubber and model surface, models made of porous materials (gypsum plasters, concrete, wood, stone, etc.) must be sealed prior to applying a release agent. SuperSeal™ or One Step™ (available from Smooth-On) is a fast drying sealer suitable for sealing porous surfaces without interfering with surface detail. Sonite™ Wax or shellac is suitable for rough contours. A high quality shellac is suitable for sealing modeling clays that contain sulfur or moisture (water based). Thermoplastics (polystyrene) must also be sealed with shellac or PVA. In all cases, the sealing agent should be applied and allowed to completely dry prior to applying a release agent. Applying A Release Agent - A release agent is necessary to facilitate demolding when casting into or over most surfaces. Use a release agent made specifically for mold making (Universal™ Mold Release available from Smooth-On). A liberal coat of release agent should be applied onto all surfaces that will contact the rubber. For best results, pour your mixture in a single spot at the lowest point of the containment field. Let the rubber seek its level up and over the model. A uniform flow will help minimize entrapped air. The liquid rubber should level off at least 1/2” (1.3 cm) over the highest point of the model surface. Curing - Allow rubber to cure overnight (at least 16 hours) at room temperature (73°F/23°C) before demolding. Cure time can be reduced with mild heat or by adding Smooth-On “Kick-It™” Cure Accelerator. Do not cure rubber where temperature is less than 65°F/18°C. Post Curing - Optional: Following an overnight cure, heating the rubber to 150°F (65°C) for 4 to 8 hours will increase physical properties and performance. 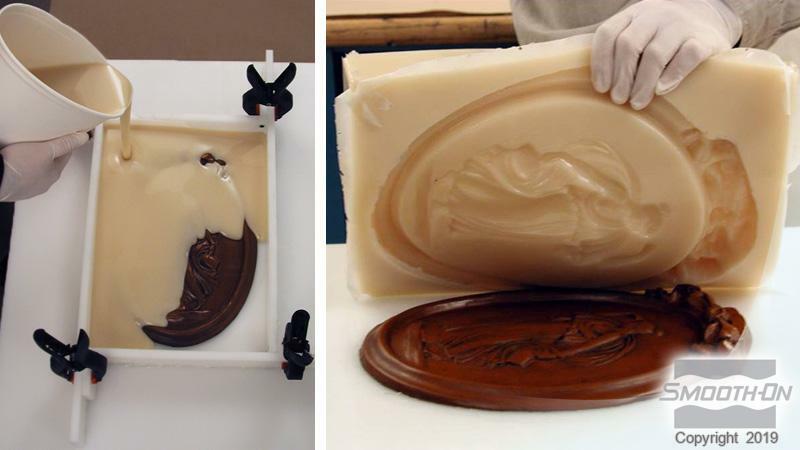 Using The Mold - If using as a mold material, a release agent should be applied to the mold before each casting. The type of release agent to use depends on the material being cast. 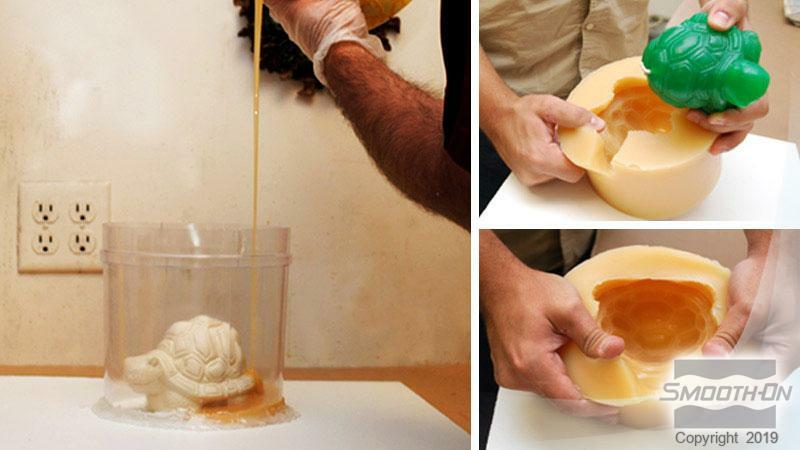 The proper release agent for wax, liquid rubber or thermosetting materials (i.e. 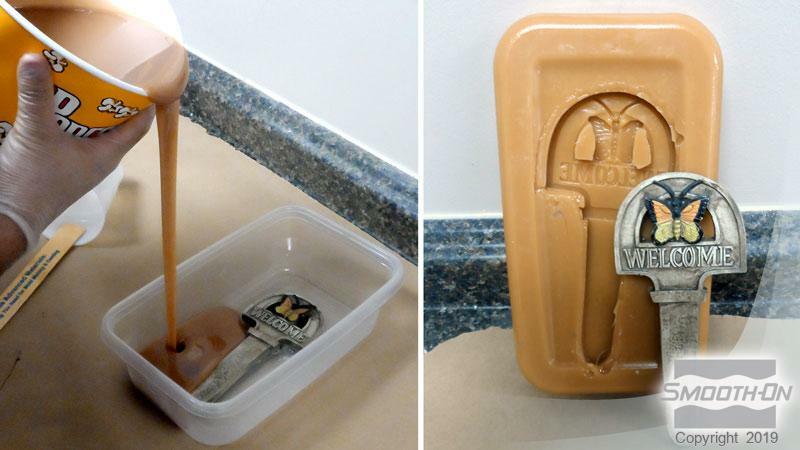 SmoothOn liquid plastics) is a spray release made specifically for mold making (available from Smooth-On or your distributor. 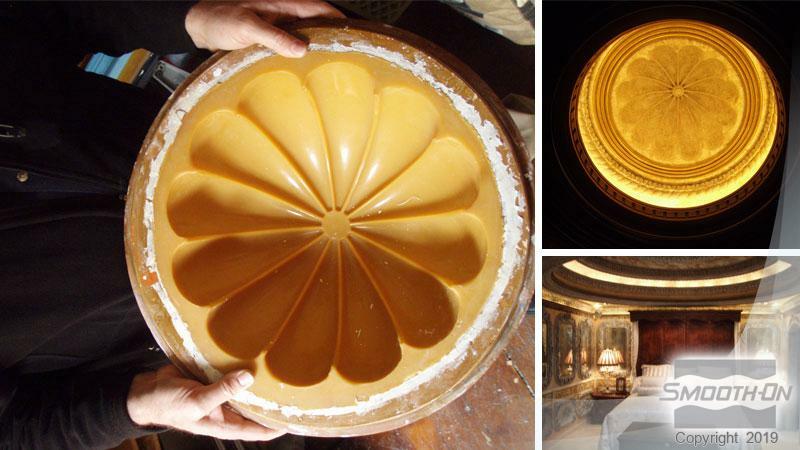 Prior to casting gypsum plaster materials, sponge the mold with a soap solution for better plaster flow and easy release. Learn how Greg Schadt of Gravity Glas Design created an amazing kiln-formed sign.